Businesses are increasingly looking to replace costly, dedicated storage area network (SAN) and network-attached storage (NAS) solutions. 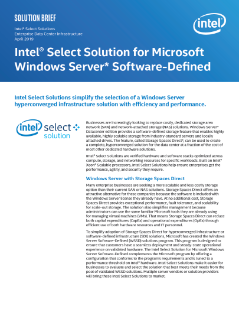 Windows Server* Datacenter edition provides a software-defined storage feature that enables highly available, highly scalable storage from industry-standard servers and locally attached drives. The feature, called Storage Spaces Direct*, can be used to create a ...complete hyper converged solution for the data center at a fraction of the cost of most other dedicated hardware solutions.